We will make your wedding, party celebration or dance very special with our engaging mix of lively ceilidh dances and songs. We have been playing together for over ten years and have a wealth of experience to make sure that your Ceilidh is perfect. Lively fiddle music, with all dances patiently explained for those less familiar with the dances, will ensure everyone is involved in an unforgettable evening. Music from our CD 'Jiggered' is available on line and from our shop. 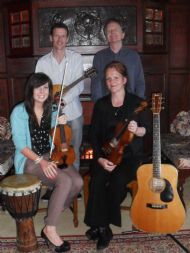 You can also view a video taken at one of our stonking ceilidhs!